Staten Island, NY - August 31, 2015 - The patriotic sacrifice and selfless courage of 9/11’s fallen heroes will be honored during the 14th annual Stephen Siller Tunnel to Towers (T2T) 5K Run & Walk in New York City on Sunday, September 27, 2015, starting at 9:30 a.m. Participants will have the opportunity to retrace the final footsteps of Stephen Siller, the late FDNY firefighter who made the ultimate sacrifice during his heroic efforts to rescue survivors of the September 11 terrorist attack, in New York City’s most beloved 9/11 remembrance event. Share their personal or team pages via social media — or encourage friends and family to help them reach their fundraising goals via email! Fundraise and earn Tunnel to Towers gear including a T2T hat, exclusive performance “tech” T-shirt or a commemorative windbreaker. Participants can also register in-person the day of the run. Race day registration will take place at the IKEA parking lot in Brooklyn between 7 a.m. and 9 a.m. Participants may purchase timing chips online only through 11:59pm on September 21, 2015. After September 21 and through September 26, a timing chip can be obtained only if you register in person at any registration site. Timing chips are not available to those registering on race day. More than 30,000 participants from all across the world, including as far away as England, are expected to embark upon New York City to attend the Tunnel to Towers 5K Run & Walk. Since the Stephen Siller Tunnel to Towers Foundation’s inception in 2002, this annual event and other related fundraising activities have raised more than $50 million for its various initiatives and programs, including, supporting our nation’s catastrophically injured service members through the Building for America’s Bravest program. Special guests including 25 of the most catastrophically injured service members and their families. The run starts at 9:30 a.m. sharp on the Brooklyn side of the Hugh L. Carey Tunnel (formerly known as the Brooklyn Battery Tunnel) in New York City. The run begins at Hamilton Avenue and Richards Street, then goes through the Tunnel, north onto West Street, left onto Liberty Street, to Battery Park Esplanade, right (east) on Warren Street, right (south) onto West Street and finishes at West and Murray Streets, across from the World Trade Center with one block as walk off area to Vesey Street. Please note: the MTA & NYPD absolutely prohibits any backpacks, strollers, bags, water bottles and bicycles in tunnel. This will be strictly enforced. For additional details please check the FAQ page. Although named after Stephen, the Run was created to honor the lives of the 343 firefighters who died during the September 11 terrorist attack, as well as pay special tribute to all the policemen, EMTs, construction workers and special people who lost their lives in their quest to save others. As always, the Tunnel to Towers 5K Run & Walk is made possible by the support of literally thousands of volunteers as well as generous sponsors and supporters including Carpet One, CBS2 New York, GMC, UPS, The Home Depot Foundation, Bracewell & Giuliani, Southeast Friends of Stephen Siller, Fresh 102.7, WCBSFM 101.1, 92.3 NOW, WCBS News Radio 880, 1010 WINS, WFAN 66 AM and Semper Fi Fund, among others. 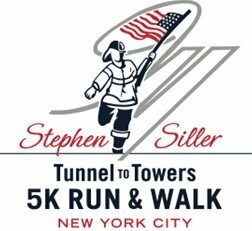 The Stephen Siller Tunnel to Towers Foundation is a charitable organization set up to follow the footsteps of FDNY firefighter Stephen Siller, who ran through the Brooklyn Battery Tunnel to the World Trade Center towers on Sept. 11, 2001, carrying 60 pounds of gear on his back, to rescue his fellow New Yorkers. Siller lost his life when the towers collapsed, leaving his wife, five children and six siblings to carry on his memory and share his story. One of the primary missions of the Stephen Siller Tunnel to Towers Foundation is to honor the military members who have been seriously injured and sacrificed their quality of life in the line of duty. We believe that the Foundation is a real and concrete way to Follow the Footsteps of an American hero. The Foundation has established the LEGACY OF LOVE and NEVER FORGET programs as our way to make a lasting and positive difference in the lives of others. These programs, together with the Foundation’s Building for America’s Bravest program, bring hope to grieving children and healing to firefighters and our nation’s most catastrophically injured service members, who sacrifice life and limb in the line of duty. To find out more about the Stephen Siller Tunnel to Towers Foundation, please visit online. Subject: LongIsland.com - Your Name sent you Article details of "14th Annual Stephen Siller Tunnel to Towers Run Continues To Honor Fallen 9/11 Heroes This September"